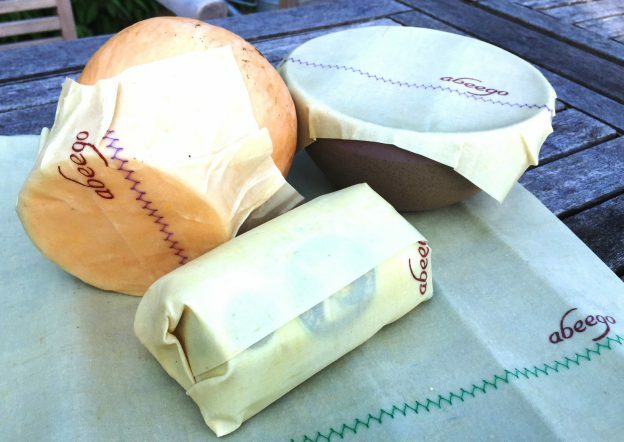 Imagine a material for wrapping food that is made entirely from natural materials and is washable, re-useable, multi-purpose and smells deliciously of beeswax… If you have never come across Abeego, do check out the lovely couple who invented it and the beautiful Abeego website. Widely available in the UK and worldwide, I have seen it in farm shops, kitchen shops, health food shops, even gift shops, as well as online. You can buy small, medium and large sheets to wrap around anything except raw meat. It keeps food fresh naturally and is great for wrapping bread and cheese for example, or for covering left-overs in the fridge. The sheets are pliable but fairly stiff from the beeswax so they stay in place where you’ve folded them. They are water repelling and don’t seem to take on the smell of the food. I adore this wrap because it is natural, beautiful and so practical. It is a bit of an investment if you’re used to buying cling film. Mine have lasted really well since I bought them a few months ago and I can’t see any use for cling film now. I think this is another great win for living without plastic! This entry was posted in Food shopping, In the kitchen, On the go and tagged Abeego, alternative to cling film, non-plastic food wrap on August 17, 2016 by admin.